If you’re not keen on the red wine flavor of the usual glögg that is served at Christmas or if you are allergic to the tannins in it, you might want to try this delightful non-alcoholic alternative which has the benefit that it can also be served to children. Place all ingredients in a large cooking pot and warm up, allowing flavors to mingle. Best served in small glass drinking cups with a handle. 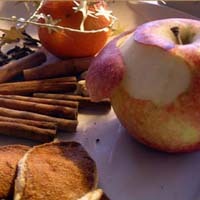 If you want to add in a touch of alcohol for a more festive flavor add in 1/2 cup or 1 dl Calvados (apple brandy).